Eating from a spoon…. a skill many infants begin learning around 4-6 months, some a little later. Typically, spoon feeding is associated with good head control and independent sitting. For many infants, the journey into spoon feeding is very exciting filled with new flavors, textures, and tastes. For others, it more difficult and may trigger gagging, vomiting, coughing and refusal. I am a firm believer in “spoon technique” for our clients. Spoon technique © – the act of opening the mouth fully for a spoon, accepting it into the oral cavity on the tongue which is slightly cupped along the floor of the oral cavity in proper position, then closing the lips to clear the bolus from the spoon as the spoon is removed from the mouth. This is a term I made up to describe the skill of retrieving food from a spoon. This is an important skill to build in therapy. So many of of our feeding clients have difficulty with this because of hypotonia, hypertonia, structural defects, postural impairments and aversive feeding behavior (not opening fully, retracting the tongue, holding the bolus under the tongue or in the cheeks) or just plain refusal. Who knew how important and useful the spoon was!!!! Sometimes caregivers tell me their child hates the spoon and prefers to finger feed. That might be fine for some children but many of the kids referred to feeding therapy do not have functional chewing skills, therefore in order to work on improving intake including food variety and volume accepted, we need to teach spoon feeding of puree. I tell my caregivers that the child can still finger feed some solids (if oral skills are appropriate). We then discuss the importance of being able to accept a spoon and get to work on it! Note: I am working therapist and use these tools on a daily basis. I do not endorse one particular company. Some of these spoons are brand specific but I do not receive any compensation from these companies, I am writing based on my experience as a therapist only. Maroon spoon (2 sizes small infant and large): The small infant maroon spoon is my go-to spoon for most of my feeding patients. I like this spoon for several reasons: the small size fits well in a new feeder’s mouth, the rounded edges are nice when using it for lateral placement and pulling out the cheek, and the spoon is relatively flat making it easy for lips to clear the bolus. It is a firm spoon which works well when providing pressure on the tongue. I use this spoon for lateral placement of puree as a prechewing exercise. 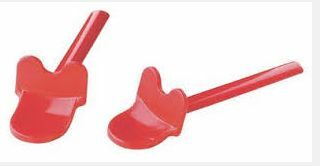 Once a child is opening well for the spoon and is able to handle the bolus effectively, then I may switch to the larger maroon spoon for midline bites. I do this when I want to offer the child a larger bite of puree which will decrease overall feeding time. ey are not quite as sturdy but still a functional option. They can be also be used for lateral placement in either the standard position or you can use the handle for lateral placement. EZ spoon: (This is Debra Beckman’s spoon) this spoon comes in 2 versions, a flexible model and a firm model. I have come to really like this spoon which is almost like a tongue depr essor. 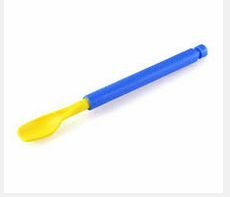 I use this spoon to elicit tongue grooving with children who retract their tongues or with a child who has a small mouth or poor opening for the spoon. I have also found this to be a great spoon for lateral placement. Lip closure spoon: This is an interesting spoon has a wide flat bowl that encourages lip spread and a border that cues the lip to come down. 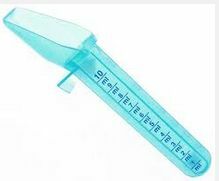 I have used this on occasion with success in getting better lip closure. Textured spoon: There are several versions of textured spoons that are flexible and firm. 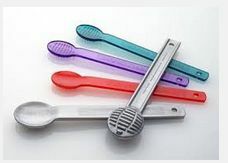 These spoons can be very helpful to improve tolerance of texture in the mouth, improve awareness and stabilization. 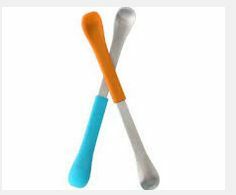 Vibrating spoon: A vibrating spoon can be helpful to improve awareness and increase muscle tone in the mouth during feeding. 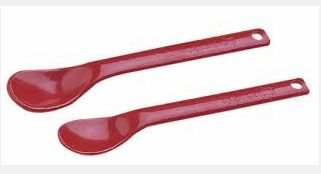 I find some of my neurologically involved patients respond best to these types of spoons. Boon Spoon: While not a therapy spoon, one of my caregivers brought this spoon in and I love the small size (great for lateral placement). I also like the fact that it is fairly flat and because it is medal it is very firm for providing pressure on the tongue. While everything needs to be considered for the individual child, I tend to not like the infant spoons that are deep bowled that make it hard for an infant to clear the bolus. I also do not like large spoons as I have had caregivers bring in spoons that were very large and would not fit in the child mouth. Lastly, I am not a huge fan of spoons that fit onto the puree pouches where the puree is being squeezed in. scraping the bolus off the upper gum ridge or teeth. This tends to discourage lip movement and many children go right into a suckle pattern with oral spill. Conversely, I discourage caregivers from trying to place a spoon in a child’s mouth that is not open, you end up with the bolus spilling off the spoon and never making it into the mouth. I discourage HUGE bites. Many caregivers feel that they may only get a few bites into the child so they load the spoon making good bolus formation and transfer difficult. I discourage dumping the bolus in the front of the mouth under the tongue. This is typically done when the child has oral sensitivity and the feeder is afraid of triggering a gag. 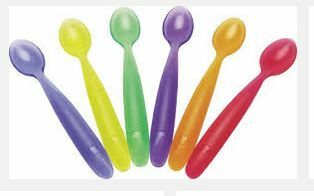 **The focus of this blog is on spoons that assist with oral motor skills. I did not include spoons specifically for self-feeding. We are clients of yours. We have been working on lateral food placement for a few months. It’s going well, accept now our Son isn’t closing his mouth for the middle placement and removing the bolus with his lips. He just sits with his mouth open like he is waiting for me to place it laterally. He is 15 months. He started this after doing lateral placement as I didn’t realize he would lose the middle spoon placement skills. I’m sure it’s because I haven’t done a good ration of middle spoon placement. How can I get him to close his mouth again using pressure on the tongue?